Mojo, pronounced mo-ho, is synonymous with Cuban cuisine. 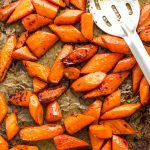 It is a garlicky, sometimes herbaceous, sauce-like mixture that is used for marinating various meats and also as a condiment on just about everything. Though I’ve never been to Cuba (it’s on my list of places to visit), I have definitely eaten my fair share of mojo. The bulk of which has been consumed in Miami. Before they passed away, my grandparents lived in southern Florida for around 15 years and I visited them at least once a year, sometimes for months at a time during the summer holidays. Cuban restaurants are aplenty throughout Miami and you’ll find Mojo at every one of them, each of which is different from the other. As far as I can tell there are no real rules to mojo. So long as it’s got the major ingredients it’s fair game. Mojo is typically made from a combination of bitter orange juice, lime juice, garlic, and oregano. The possibilities, however, are endless and other countries have their own versions of Mojo. It’s also popular in Spain, the Canary Islands and other Caribbean islands. You can use Mojo to marinade pork, chicken, beef and even fish. I keep things fairly simple but I do add one secret ingredient: coriander seeds. 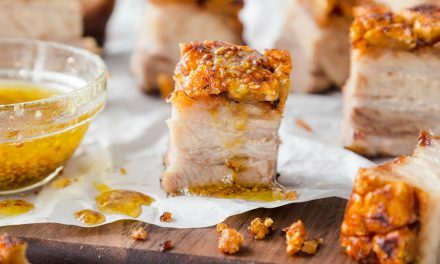 Few things pair better with the flavours of orange than coriander and this Mojo Roast Pork is no exception. I also think it’s totally fine to use fresh-squeezed orange juice instead of bitter orange juice. If you can find the latter than go for it. If not, don’t sweat it. You’ll notice that this recipe calls for two types of mojo. One is used as a marinade for the meat and the other is what I like to serve as a condiment for the finished product. They are basically the same thing except that I add fresh herbs to the condiment. 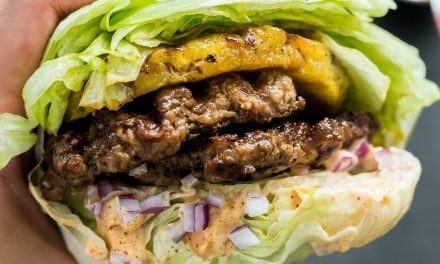 The condiment goes great with my recipe for Easy Tostones. I had big plans to roast some pork shoulder last week when I was ordering meat from RealFoodToronto.com, which is the grocery delivery service offered by The Healthy Butcher. I’ve said it before and I’ll say it again, this is my favourite butcher in Toronto and they carry some of the absolute best meat you can hope to find. 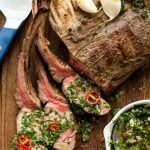 You may already know that I am a huge fan of their grass-fed beef, which I used in my YouTube recipe on How to Cook the Best Steak. If you want to take a break from beef, this Pork chop will hit the spot. I was extremely disappointed when I got a phone call from the butcher saying that they were out of pork shoulder. I was overjoyed, however, when she told me that she could substitute a wild boar shoulder instead at the same cost. I kid you not, I felt like I just won the lottery. I took the phone away from my ear, did a quick happy-dance and let out a faint squeal from the excitement. Say what you will, I’m passionate about ingredients. 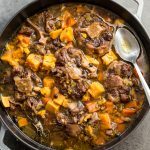 Thus while the title of this recipe does indeed say Mojo Pork for SEO purposes, you are most definitely feasting your eyes on the most beautiful shoulder of wild boar. Before I get to the cooking part I would like to mention one thing. 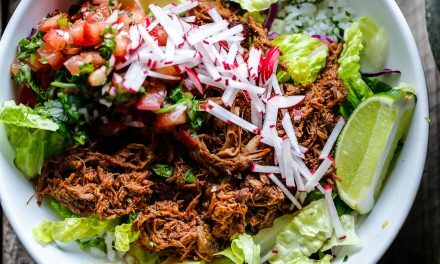 This recipe was inspired by a recent visit to a Toronto restaurant called La Cubana. They make a lovely roast pork and an even better roast short rib, both of which they serve with purple cabbage slaw, tostones, and rice and beans. I skip the rice and beans when I eat there and sub-in extra tostones and slaw instead. What you see here is an homage to my meal at La Cubana, which I went to twice in one week. Yup, it’s good. 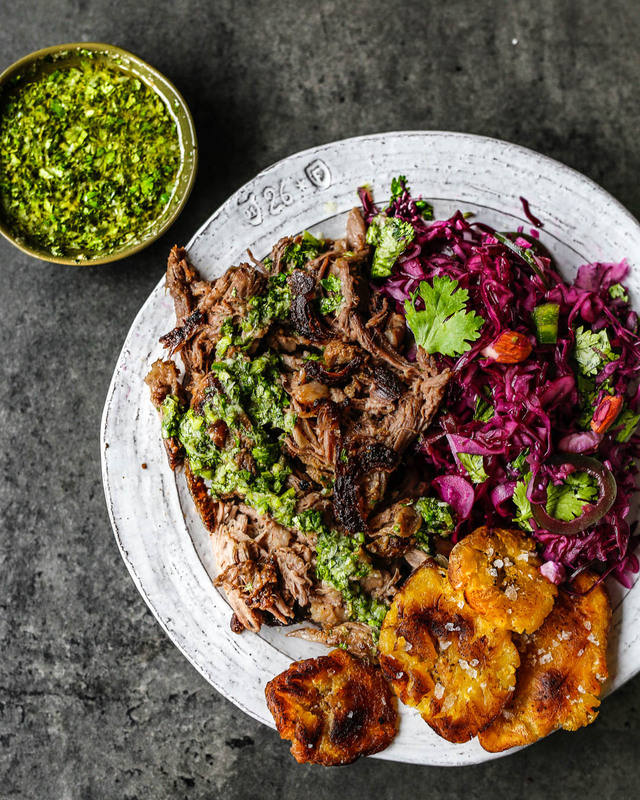 You can serve this Mojo Roast Pork (I mean wild boar) with any side you like but it goes particularly well with a Zesty Purple Cabbage Slaw and Tostones. Click here for Zesty Purple Cabbage Slaw Recipe. Click here for Tostones recipe. 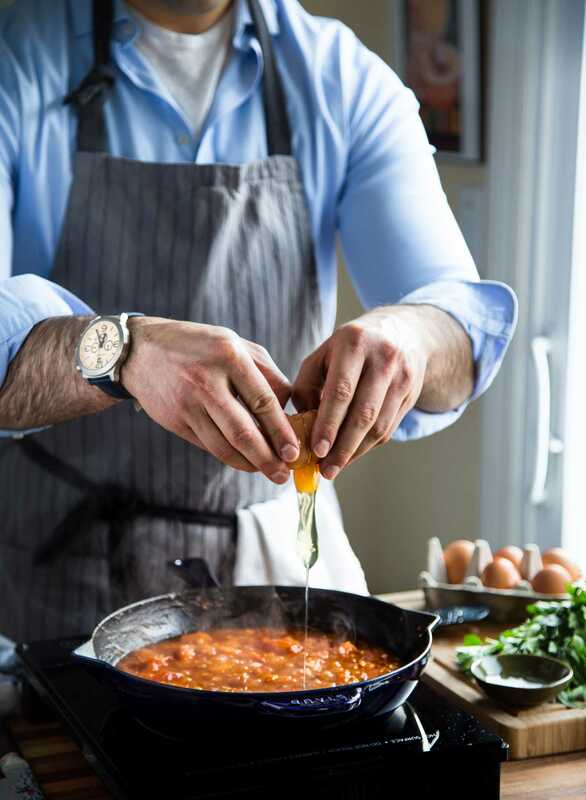 In a blender, blend together garlic, coriander seeds, orange juice, lime juice, and olive oil. Transfer the mixture to a mixing bowl or mason jar along with finely chopped oregano, mint, and cilantro. Season with salt and pepper to taste. Cover and refrigerate for at least one hour or overnight if preparing ahead of time. 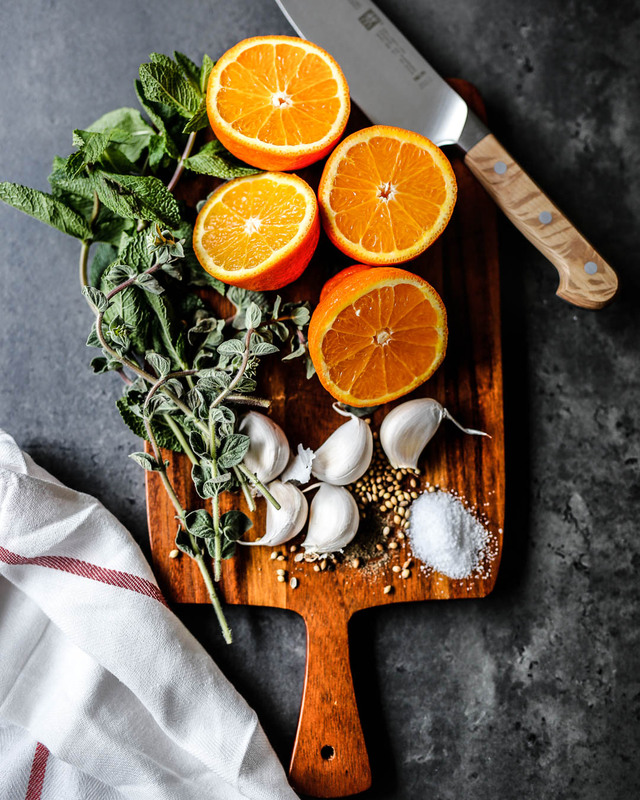 The day before cooking, combine the garlic, coriander seeds, orange juice, lime juice, and olive oil in a food processor or blender and blend until completely smooth. Pat pork shoulder dry with a paper towel and score the fat cap with a sharp knife. Liberally season all sides of the pork with salt and pepper. Transfer to a large sealable bag set within a large bowl. 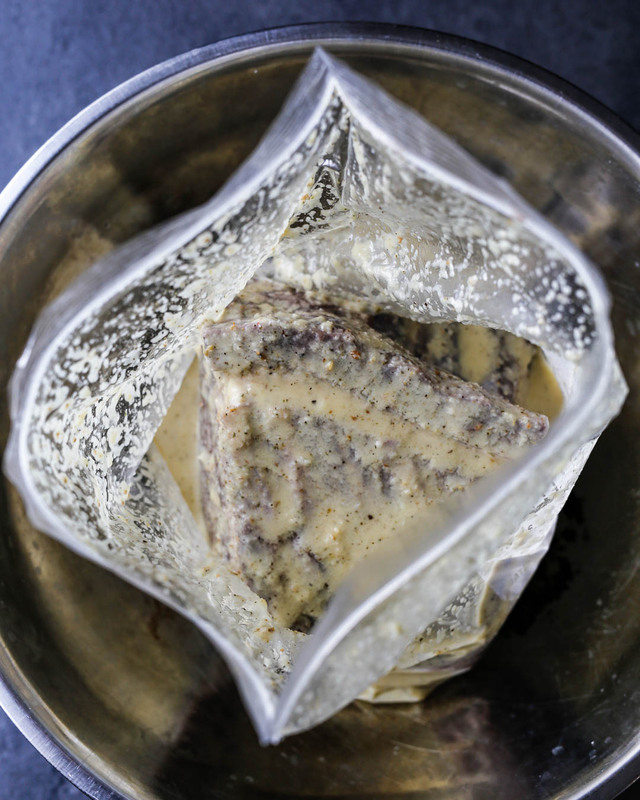 Pour in all of the marinade and seal the top of the bag. Using your hands, massage the marinade around the pork. Refrigerate overnight. The day of cooking, preheat the oven to 225F. 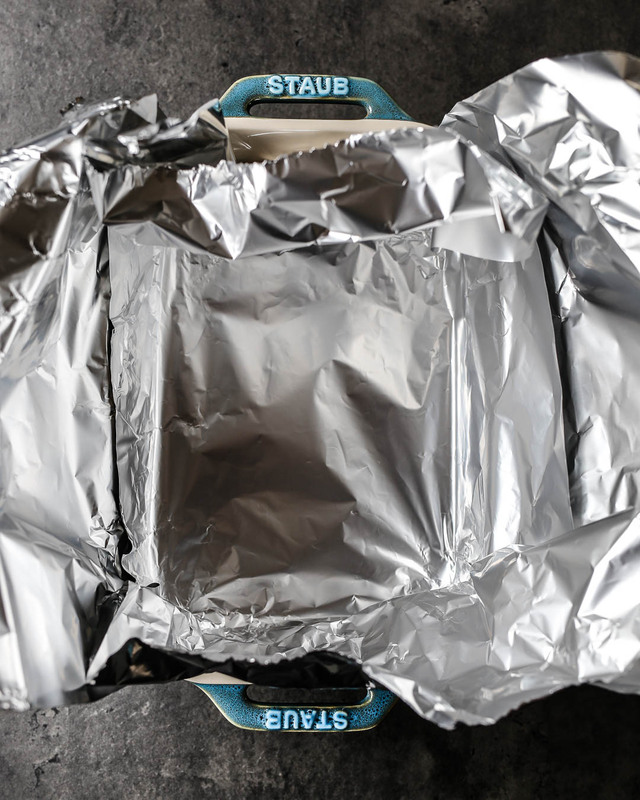 Line a deep baking dish with two-three layers of aluminum foil. 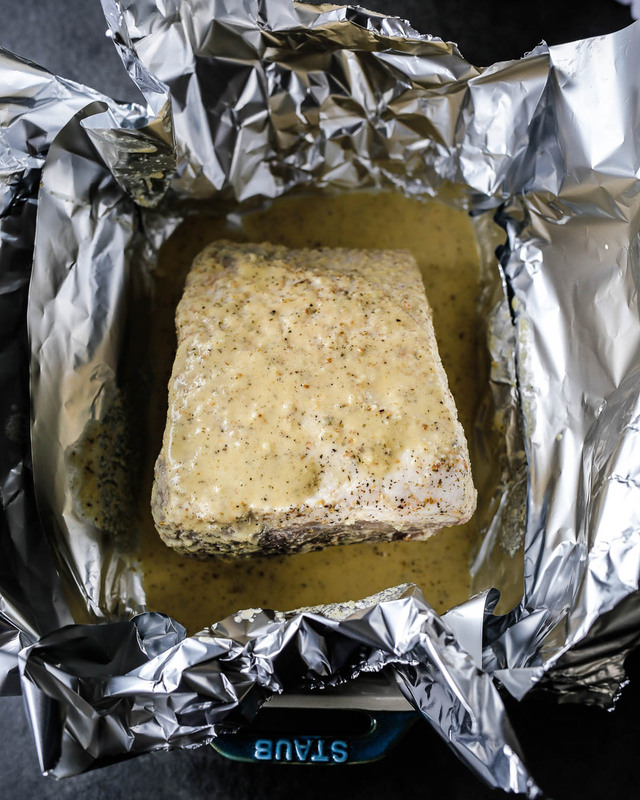 Lay the pork in the middle, fat side up, pour in the marinade and tent the meat with the foil. 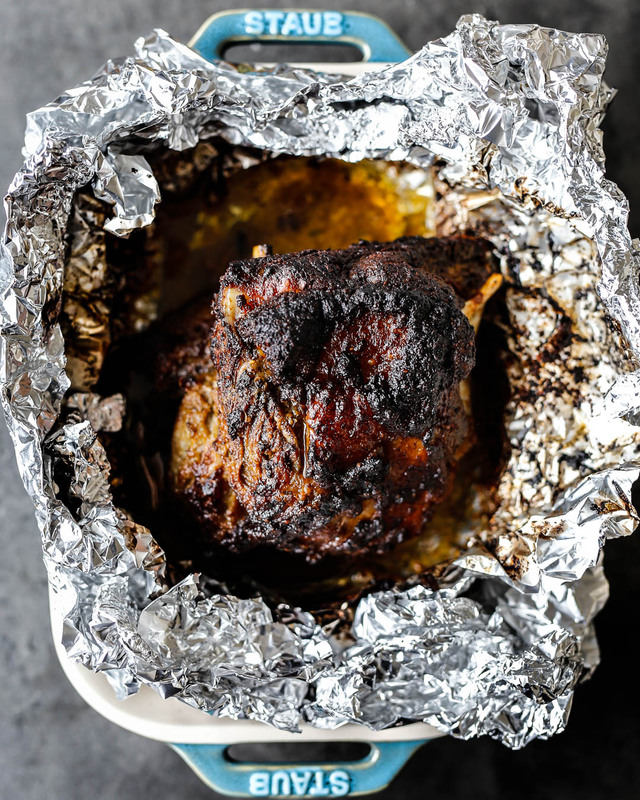 Open the top of the foil, turn up the heat to 350F and roast for an additional 2 hours. Regularly baste the pork with rendered juices for the second half of the cooking process. Remove pork from oven when the fat cap is browned and crispy and the meat is fork tender. Transfer pork to a bowl and let cool for 10-15 minutes. Using your hands, shred the pork meat. 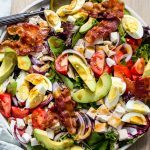 Enjoy with the Mojo dressing alongside Tostones and Purple Cabbage Slaw. Just made the slaw and starting the pork right now after marinating overnight. Question for you, do I also include the overnight bagged marinade in the baking pan with pork or omit it? Thanks! Sorry about that! Yes, pour in the marinade along with the pork. I’ve amended the recipe to include that step. Thanks for pointing that out. I hope it turned out OK! A 3-4lbs shoulder should serve 4 adults with some leftovers. I usually approximate 1/2lbs per hungry person for a bone-in shoulder because I take into account the weight of the bone. 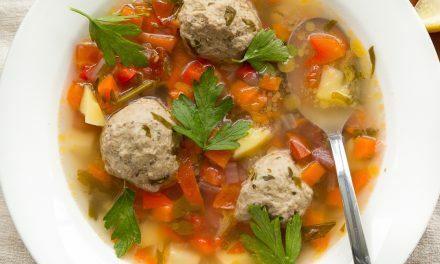 could i use this recipe for the crockpot? Definitely! I’d say 5 hours on high would do the trick. Just be sure to slide it under the broiler before serving to crisp up the edges. This mojo pork is my favorite! I found it about 6 months ago and have made it about a dozen times. So good! Amazing! So glad you love it! 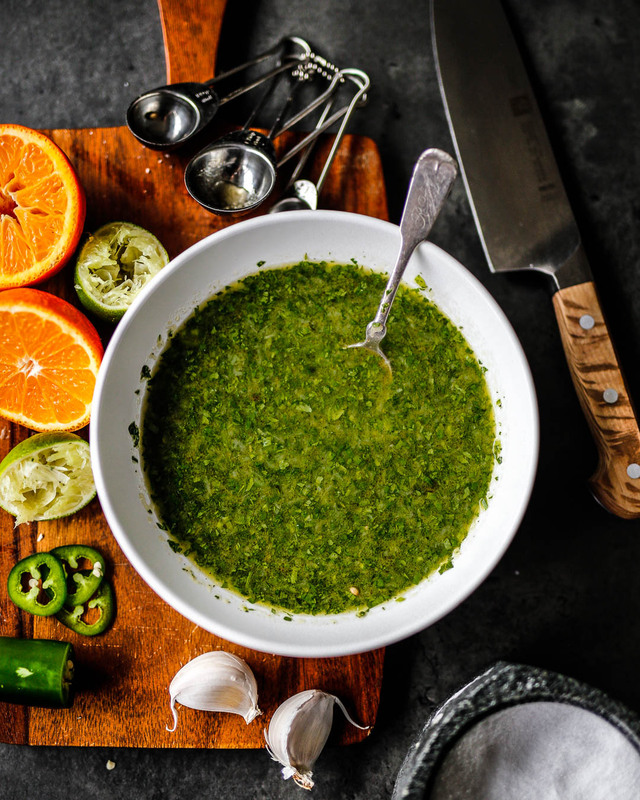 Is there a recipe for the green sauce pictured above? Yes! That’s actually the same Mojo that is used as a marinade. You can reserve a bit extra for dipping as long as the sauce does not come into contact with raw meat. I am bookmarking your website! I am on whole 30…would you recommend a sub for the orange juice? Or could I leave out or put water instead? Thank you!! Are you omitting orange juice for any particular reason? Freshly-squeezed OJ is Whole30 compliant. Otherwise, try pineapple or grapefruit juice! Water is a possibility but will not give you the same flavour. Hi Jenny, the difference between the Mojo Sauce and the Mojo Marinade is the addition of herbs in the former. 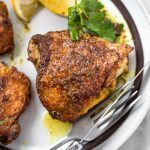 The marinade does not require the fresh herbs. I hope that answers your question and, more importantly, I hope the recipe turned out well! Made the whole thing tonight: pork, slaw, tostones. So. good. Just wish my pork shoulder would have been a little bigger for more leftovers.